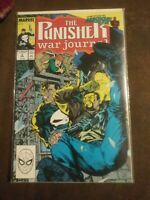 Punisher War Journal (1988) #9 NM- 9.2 Black Widow,Jim Lee; $4 Flat-Rate Ship! Punisher War Journal (1988) #36 NM- 9.2 Marvel Comics;$4 Flat-Rate Shipping! *Punisher War Journal (Vol. 1, '88) 56 Book LOT! #2-56, 58! Romita Jr.! Jim LEE!